The quality, fire-safe steel construction of each swing top receptacle offers peace of mind and space-defined access. Use with Model 9656SS 21-Gal. Stainless Steel Receptacle Base. The positive-action, snug-fitting, self-closing doors conceal contents while keeping odors inside. 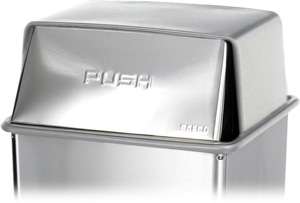 Lift-off, two-way push style lid allows easy access for emptying. Easy-to-maintain brushed Stainless Steel finish.